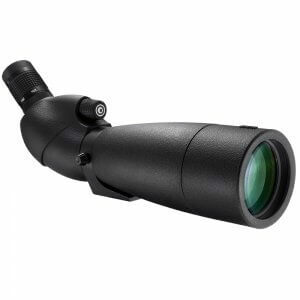 The straight viewing Colorado 30-90x90mm WP Spotting Scope allows for long-range observations with 30x to 90x zoom magnification and 1.5 - 0.75° angle of view range. 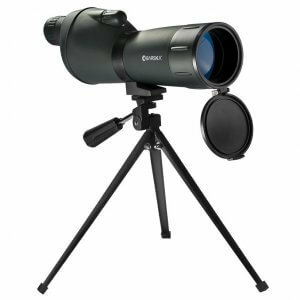 Its 90mm diameter objective lenses can gather light needed for viewing in low-light conditions like dusk or dawn, or night sky observations. 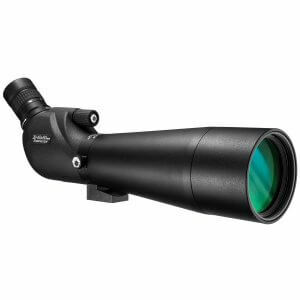 Additionally, the spotting scope has fully coated optics which improve light transmission and image clarity compared to uncoated optics. 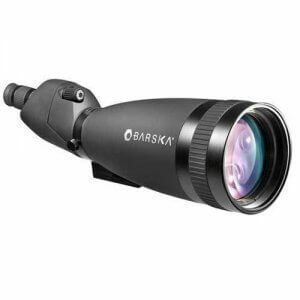 Barska’s Colorado Spotter Combo has everything you need for long distance observations. 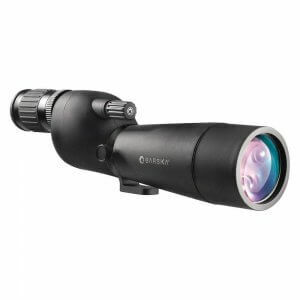 The 30-90x90 Colorado Spotting Scope features the perfect magnification range for up-close spotting or general observation. 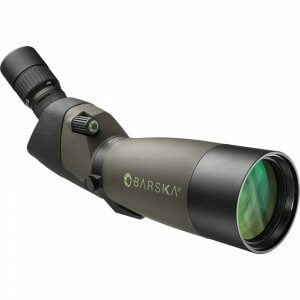 Fully-coated optics also provide the user with clarity and performance, even at greater distances. 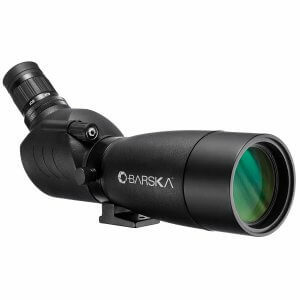 This spotter combo also includes Barska’s Deluxe Tripod, which features a lightweight build and included carrying case. 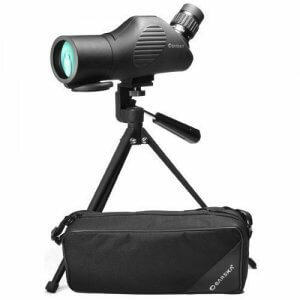 Together these items provide steady viewing at higher magnifications. 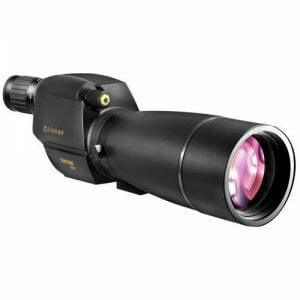 Boasting a powerful 30-90x zoom range, the Colorado spotter is well-suited for a wide range of viewing scenarios. At 30x, the spotter can be used for general observation. See something interesting? Easily zoom to 90x magnification to get a more detailed look. When viewing at such high magnifications, it’s important to have a focusing system that will deliver fine adjustments. The side-focusing knob is conveniently located to allow the viewer to maintain a visual on their subject while they are focusing in for a clearer look. An included tripod provides a solid viewing platform right out of the box, and helps the user maintain constant visuals at higher magnifications. This fully adjustable tripod is lightweight and comes with a carrying case for easy transportation. In order to maintain a sharp, glare-free view, the Colorado spotter features an extendable and collapsible sunshade. This prevents any sunlight from diminishing the quality of the view while maintaining excellent color transmission and contrast. 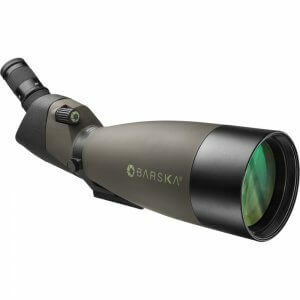 For the money I spent, this is the best spotting scope in the market. I needed a scope for the range, so I did a lot of research to find the best bang for my buck. This was the only one that came with great image clarity, decent magnification, a tripod, AND a price well below the other competitors. Took it to the range the day I got it and it can see up to 400+ yards no problem. 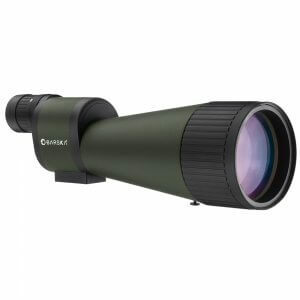 This is a really affordable spotting scope that goes above and beyond its price. I can’t be more happy about the purchase.